SKU: 150C. Listed in: Halloween, Makeup, Makeup, Zombie. Tags: Blood, Mehron, Red, Small, Squirt. Squirt blood in bright arterial red color 14ml bottle. This is Deluxe stage quality blood made by Mehron. 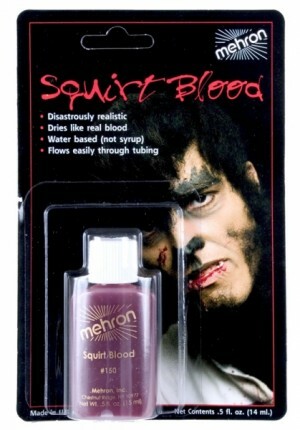 Ideal for your Vampire costume.